Micro content is what it sounds like—short, concise information that stands alone and is easily consumable. In Flare, it begins with the creation of a collection of brief phrases and corresponding responses, such as questions and answers. After generating HTML5 output, these phrase/response combinations can be used in different ways as users interact with your output. Among other benefits, it can greatly improve the user experience when people search in your HTML5 output. There are multiple potential uses for micro content, but some take more effort than others. As the following diagram shows, there is one use—featured snippets in search results—that is quite easy to produce, and all steps can be completed in a matter of minutes in Flare. As for other possible uses, you can create the phrase/responses in Flare, but then you would also need to do additional work outside of your project (possibly with the assistance of a third-party application) in order to produce the final result. Just how much work depends on what you are trying to accomplish. Micro content that is created in a Flare project can result in custom featured snippets in your output’s search results. 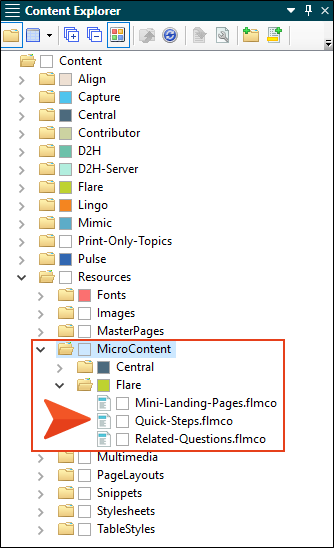 This is the easiest, most immediate way to use micro content from Flare. As with most of the SERP features that you see in Google, the featured snippets in Flare output appear above regular search results, thus making them especially valuable. In other words, you can always ensure that this targeted information is seen before anything else, rather than buried among the rest of the results. Although these are referred to as “featured snippets,” don’t confuse them with the regular snippets in a Flare project. As you will see, micro content can be created with the help of regular snippets, but that is purely optional. 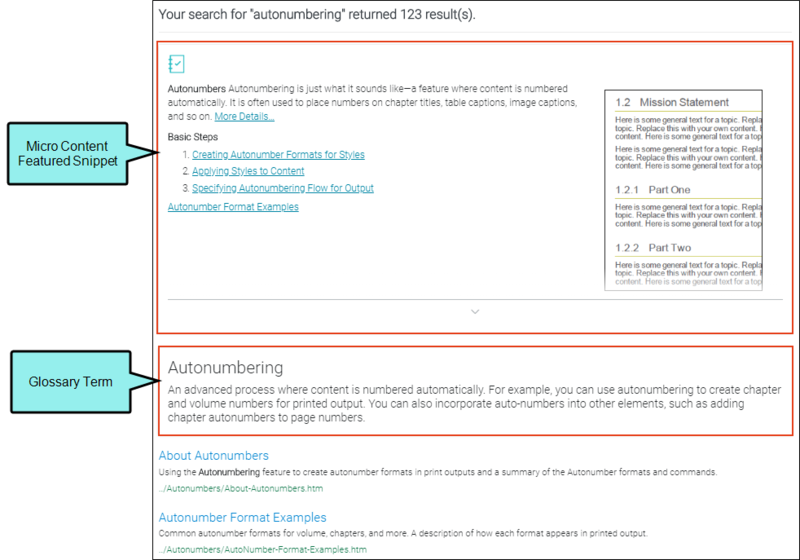 Note: To create featured snippets for your search results, you need to be using either Elasticsearch or MadCap Search as your search engine (see Setting Up a Search Engine). Also, this feature is supported only with HTML5 skins (Side Navigation, Top Navigation, Tripane), as well as skinless outputs. To accomplish any of the above, you might need the assistance of an experienced programmer and/or third-party applications. For more information, see How to Use Micro Content for Advanced Purposes. Create The first step in using micro content, for whatever purpose, is to create it in Flare. 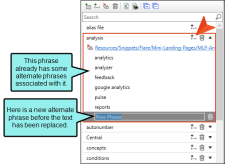 This entails adding a micro content file to the Content Explorer and then adding phrases and responses within it. See Creating Micro Content. 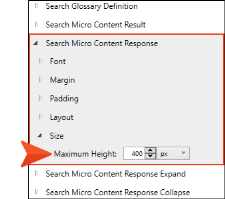 Enable in Search Results If you intend to use micro content in your HTML5 output search results, you need to make sure it is enabled in the target. 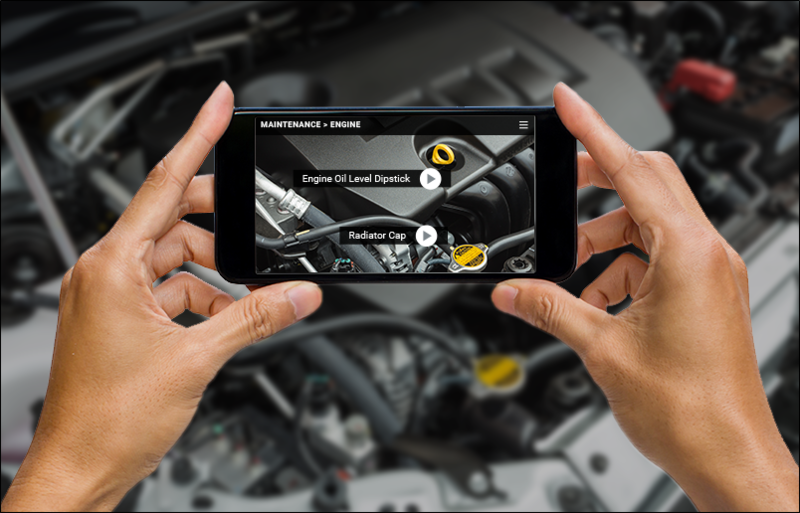 See Enabling Micro Content in Search Results. Edit Look If you integrate micro content into your HTML5 search results, there are different ways you can control its look. This is done in an HTML5 skin. See Editing the Look of Micro Content. 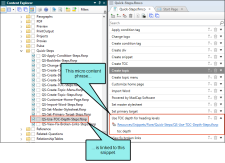 To start creating micro content, you first must add a micro content file to the Content Explorer. It is recommended that you create a subfolder named "MicroContent" under the Resources folder. Then right-click on that subfolder, select New > Micro Content, and complete the fields to create the new file. 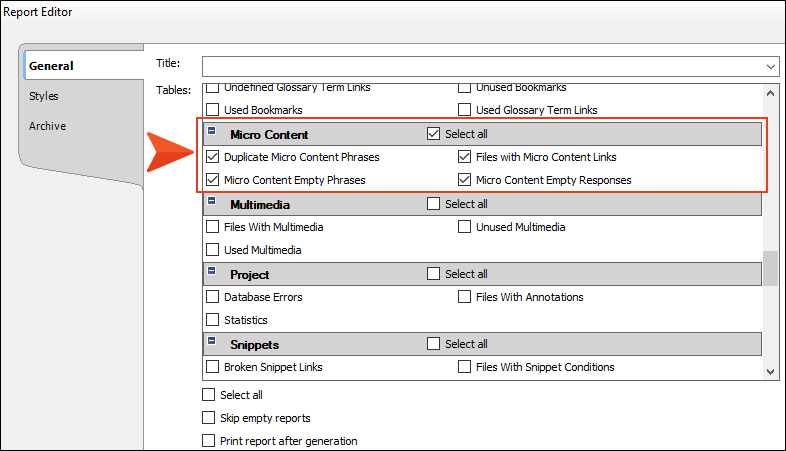 A micro content file opens in the Micro Content Editor, where you add phrases and responses. Initially, you will see one phrase/response combination, which you can replace with your own content. See Creating Micro Content. 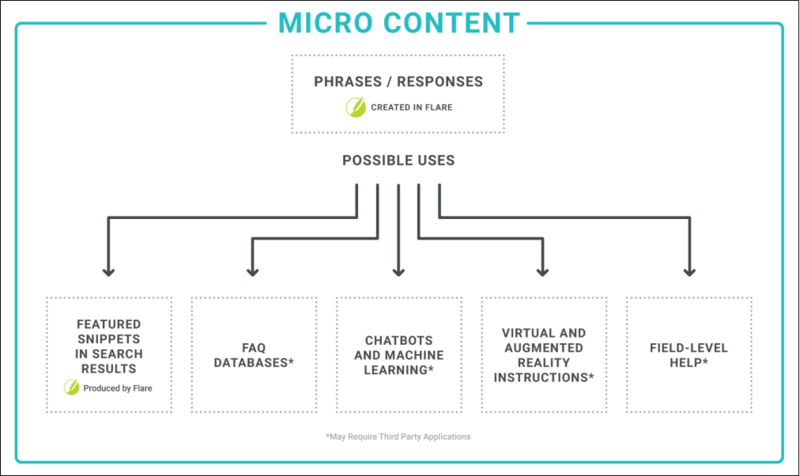 The first part of micro content is the phrase, which is what a reader uses when performing a search (or interacting with, say, a chatbot). In Flare’s Micro Content Editor, you can use the local toolbar to create and manage phrases. The phrases are listed in a grid, where you can use additional options specific to each phrase. When you select a phrase in the grid, the associated response is shown in the area to the right. Adds a new phrase to the grid below. Replace the generic text with your own phrase. You can also right-click in the grid and select Add Phrase from the context menu. The keyboard shortcut option is CTRL+SHIFT+N. Adds a new alternate phrase under the main phrase that is selected in the grid below. Replace the generic text with your own alternate phrase. Adding an alternate phrase ensures that the response will display for the end user, even though the main phrase is not used. 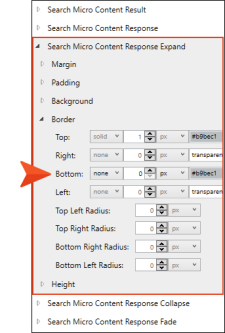 You can also right-click in the grid and select Add Alternate Phrase from the context menu. Opens a dialog, which lets you choose a topic or snippet, linking it to the main phrase that is selected in the grid below. You can also choose a bookmark within the linked file. 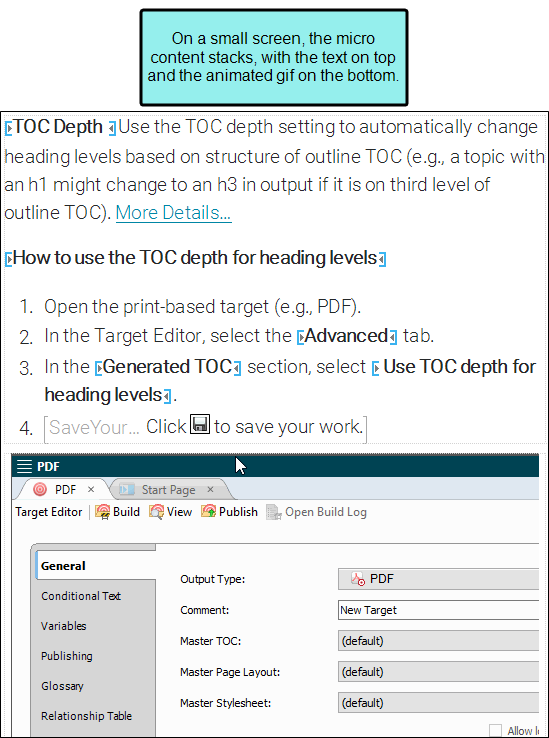 After adding a link, the content in the linked file is shown in the response area to the right, although it is read-only; to edit the content, you must do so in the topic or snippet file itself. If you selected a bookmark when linking the file, the response will include any content after the point of that bookmark in the file. The linked file name is also shown under the main phrase when you expand it in the grid. After adding a link, the button changes to , which you can click to remove the link. 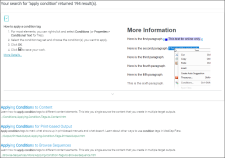 In the response area to the right, the content from the linked file is converted to text. 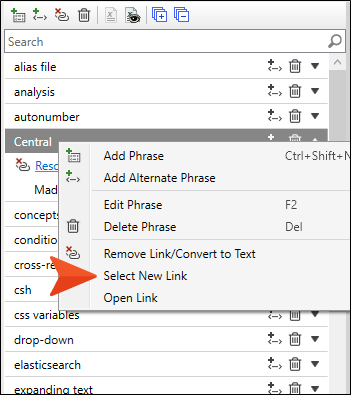 You can also right-click in the grid and select Add Link or Remove Link/Convert to Text from the context menu. Deletes the selected phrase or alternate phrase in the grid. Use caution when deleting a main phrase, because any associated content entered directly into the response area (as opposed to a linked file) will also be removed. 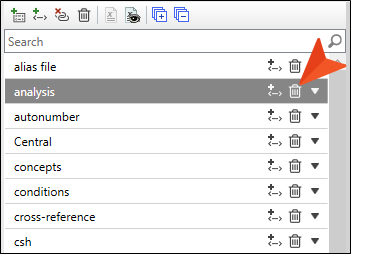 You can also right-click in the grid and select Delete Phrase from the context menu. Opens the Variables dialog, which lets you insert a variable into the phrase. This button is enabled only if you first select the phrase text (e.g., click it and press F2) so that it can be edited. See Inserting Variables. Toggles between showing or hiding any variable definitions found in the grid. By default, only the variable syntax is initially shown, but after clicking this button, you will see its definition. Expands all the phrase entries in the grid below, so that you can see any links or alternate phrases associated with them. Collapses all the phrase entries in the grid below, so that you can see only the main phrases, rather than any links or alternate phrases associated with them. You can use the search filter field under the local toolbar to quickly locate a particular phrase. Clearing the filter field will again show all phrases. Following is a micro content file containing many phrases. Let’s say we want to see only the phrases containing the word “topic.” In that case, we would type topic into the search bar and the phrases would immediately be limited to those with that word. After removing the word “topic” from the search bar, the full set of phrases is shown again. Expand Entry You can double-click a main phrase to expand it, thus showing any linked files or alternate phrases below it. Alternatively, you can click to the right of the phrase, which then changes the button to . Add Alternate Phrase To the right of the appropriate main phrase, click . This adds a new alternate phrase under the main phrase. Replace the generic text with your own alternate phrase. Delete Phrase To the right of the phrase, click . For alternate phrases, this button appears to the right only when you hover over that alternate phrase. 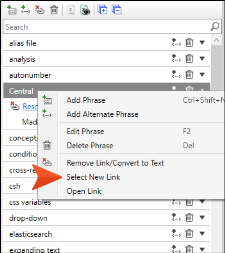 Link File to Phrase After expanding a phrase in the grid, click Add Link. In the dialog, find and select a topic or snippet to be used as the response for that phrase. You can also choose a bookmark within the linked file; in that case, the response will include any content after the point of that bookmark in the file. You can also right-click in the grid and select Add Link from the context menu. Remove Link Under the main phrase, click . The link is removed from the phrase, but the content in the response area to the right remains after being converted to text. You can also right-click in the grid and select Remove Link/Convert to Text from the context menu. 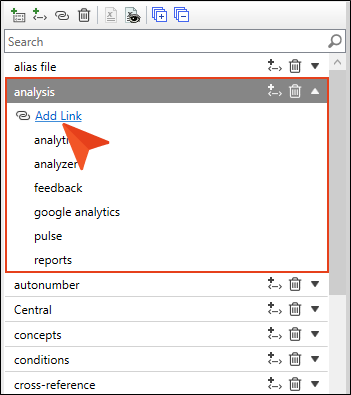 Select New Link Right-click on a phrase that is linked to a file and choose Select New Link. 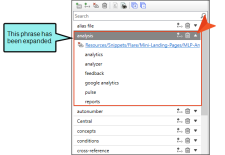 In the dialog, find and select a topic or snippet to be used as the response for that phrase, instead of the currently linked file. Open Linked File Under the main phrase, click on the name of the topic or snippet that is linked. That file opens in the XML Editor so that you can edit it. You can also right-click in the grid and select Open Link from the context menu. The following shortcuts can be used in the phrase grid of the Micro Content Editor. Exactness of Phrases What if a user enters search text that is close to your micro content phrase, but the wording is not exact? 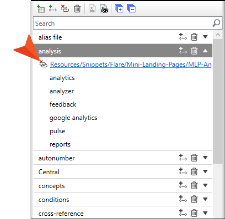 For example, maybe your phrase is “create widget” but a user enters “creating widget.” Fortunately, Flare uses a scoring mechanism behind the scenes that allows for slight differences between a phrase and the text entered in a search. To account for searches that are not close enough to be handled automatically by Flare’s calculation, you should create alternate phrases. There isn’t a way to measure this beforehand; you simply need to test your output and adjust your micro content accordingly. Analytics The response part of micro content is important, because it contains the information that the reader needs. However, the initial phrase (or search term) portion of micro content is just as important, if not more so. Why? Because the response will be completely useless if users never encounter it. It is vital that you begin with the correct phrases (or questions). So how can you be sure you are using the right phrases? You could just rely on educated guessing, or perhaps you created a glossary some time ago that gives you an idea of what users might want to know about. But a better approach is to use analytics on your output, such as MadCap Pulse, Google Analytics, or some other resource. After looking at reports of the most commonly used search keywords, you can create micro content with the same phrases. See Analysis, Reporting, and Feedback. 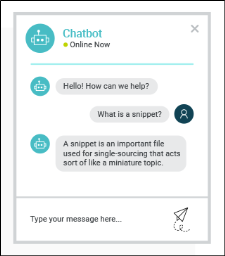 For each micro content phrase, you need a response, which is what the end user sees after performing a search, interacting with a chatbot, etc. You can enter a response directly on the right side of the Micro Content Editor, which works like a light version of the XML Editor. You can also use an existing topic or snippet (or part of it) as the response by linking to it. Another method is to select content in a topic or snippet and turn it into a micro content response. If you decide to enter content directly into the Micro Content Editor, you can use toolbar buttons for certain features. 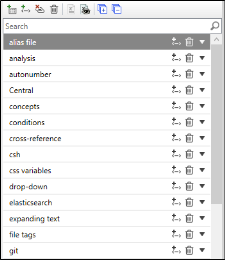 You can also use some options in the ribbons to insert other features (e.g., lists); the local toolbar simply contains buttons for some of the most frequently used features. Clicking the down arrow on this button lets you select a medium or media query so that you can view the topic with a specific set of styles. See About Mediums and Media Queries. Opens the Insert Hyperlink dialog, which lets you insert a text hyperlink on the selected text. See Inserting Text Hyperlinks. Opens the Insert Cross-Reference dialog, which lets you insert a cross-reference at the location of the cursor. See Inserting Cross-References. Opens a dialog, if you click the face of the button. You can use this dialog to insert an image. If you click the down arrow on the button, a drop-down opens, where you can access your pinned images and recently used images. See Inserting Images. Opens the Insert Snippet Link dialog, if you click the face of the button. You can use this dialog to insert a snippet. If you click the down arrow on the button, the Insert Snippet drop-down opens, where you can access your pinned snippets and recently used snippets. See Inserting Snippets. Opens the Variables dialog, if you click the face of the button. You can use this dialog to insert a variable. If you click the down arrow on the button, a drop-down opens, where you can access your pinned variables and recently used variables. See Inserting Variables. Opens the Character dialog, if you click the face of the button. You can use this dialog to choose a character to insert or perform many other tasks. If you click the down arrow on the button, you can select other options, such as inserting a quick character or choosing one of your favorite or recent characters. See Inserting Characters and Symbols. Turns paragraph and space markers on and off. 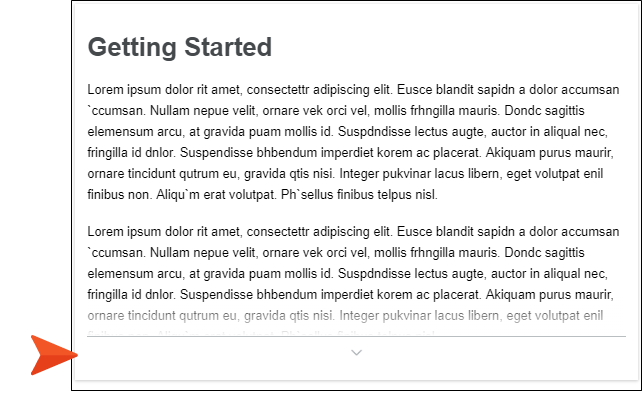 When you turn this feature on, you can see markers that show where paragraphs end and where space exists before and after content. If you click the face of this button, all of the content changes, showing the XML tags surrounding the content. If you click the down arrow, you can select various other options (see XML Editor for more details). Remove Link/Convert to Text The link is removed from the phrase, but the content in the response area to the right remains after being converted to text. 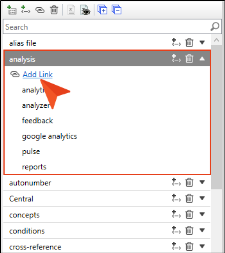 Select New Link In the dialog, find and select a topic or snippet to be used as the response for that phrase, instead of the currently linked file. 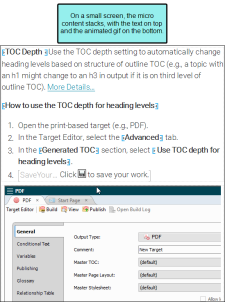 Open Linked File The linked file opens in the XML Editor so that you can edit it. Keep It Short Remember that micro means “small.” Flare lets you add lots of different things to micro content (e.g., paragraphs, lists, steps, images, animated gifs, videos, links, tables), the same kind of content you can add inside a topic. But that doesn’t mean that you should add lots of content. Try to keep your micro content as short as possible, while not sacrificing necessary information. In the Skin Editor, you can set a maximum size for featured snippets in the output. See Editing the Look of Micro Content. If a response exceeds the height in the output, an arrow button lets users expand and collapse the content that is not initially shown. Responsive Structure Depending on the subject matter, you might want to structure a response to show text on one side and something else—such as an image, animated gif, video, or table—on the other side. If you do this, you might consider using a responsive layout for the structure, so that the different elements stack on top of one another when viewed on a small screen. See Creating Responsive Layouts. In the output, the image in the above example will display to the right of the steps, but on a smart phone, the image will display below the text. You can enter content directly in the Micro Content Editor. You can link a phrase in the Micro Content Editor to a topic or snippet (or a bookmark within such a file). 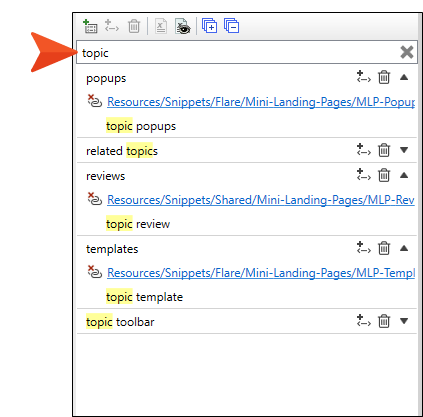 You can select specific content in a topic or snippet and create new micro content from there. The phrase you create will then be linked to that specific content in the topic or snippet. This method is simple. Just start adding content in the editor. You don’t have as many options as you do in a topic or snippet. 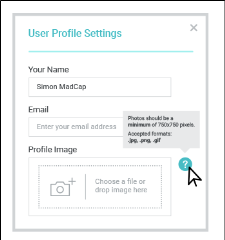 For example, you cannot add a responsive layout directly in the Micro Content Editor, but you can copy content such as this from a topic or snippet into that editor. If you already have a topic that is suitable for micro content, you do not need to create new content, but instead just link to the existing file. Linking to some topics (even using a bookmark) might be too much content for a micro content response. In a topic, you can use all of the editing features available in Flare. You can link to the entire topic, or to a bookmark within it. If you link to a bookmark, the output will show all of the content after that bookmark, but none before it. 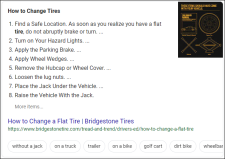 A link is automatically added to the bottom of the featured snippet in the search results, which lets users open the corresponding topic on a new page. Not only will the content display in the featured snippet in search results, but an abstract and link to the topic will also appear with the rest of the search results. 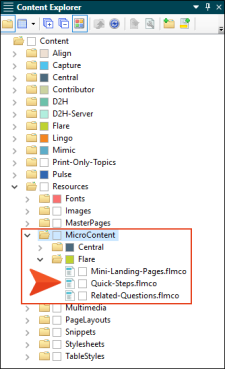 If you already have a snippet that is suitable for micro content, you do not need to create new content, but instead just link to the existing file. Linking to some snippets (even using a bookmark) might be too much content for a micro content response. In a snippet, you can use all of the editing features available in Flare. You can link to the entire snippet, or to a bookmark within it. If you link to a bookmark, the output will show all of the content after that bookmark, but none before it. In addition to linking a snippet to a micro content phrase, you can also reuse the snippet in other places in your project. If you already have a topic or snippet that contains content that is suitable for micro content, you do not need to create new content, but instead just link to the content. Some content contained in a topic or snippet might look just fine as a standalone micro content response. However, sometimes you might find the need to make edits to that content first. In a topic or snippet, you can use all of the editing features available in Flare. 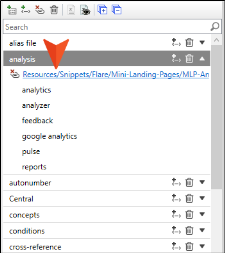 This method lets you be more specific with the response than if you were to link to a topic or snippet from the Micro Content Editor. You can keep the response limited to just the content that you choose. If the micro content was created in a topic (as opposed to a snippet), a link is added to the bottom of the featured snippet in the search results, which lets users open the corresponding topic on a new page. If the micro content was created in a topic (as opposed to a snippet), not only will the content display in the featured snippet in search results, but an abstract and link to the topic will also appear with the search results. If you have a glossary term that is the same as a micro content phrase, both will be displayed in the output. The micro content featured snippet will be on top, with the glossary term following it. 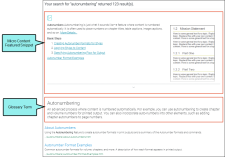 Depending on how similar the content is between them, you might decide to remove one of them so that you are not displaying duplicate information to end users. See About Glossaries. We currently do not use micro content for chatbots or other applications that require extra programming outside of a Flare project. However, we do use micro content extensively for featured snippets in search results of the output. Our approach involves the following. 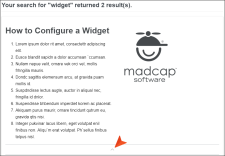 Our online output is integrated with MadCap Pulse, which gives us access to various reports (see About MadCap Pulse). 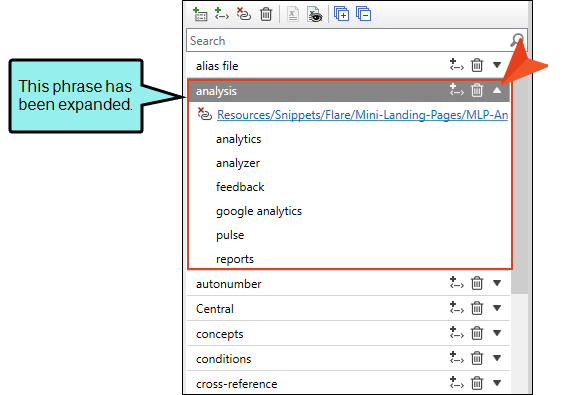 We sort the Search Phrases report to see which terms end users are entering most often for searches. Based on these results, we create our micro content phrases and alternate phrases in the Flare project. Quick Steps First, we noticed phrases containing verbs (e.g., apply condition tag, import Word), indicating that users are trying to find information on how to complete a specific task. Therefore, we created a micro content file and named it “Quick-Steps.” The response for each of these micro content phrases is a very brief set of steps, usually a shortened version of the main topic for that task. 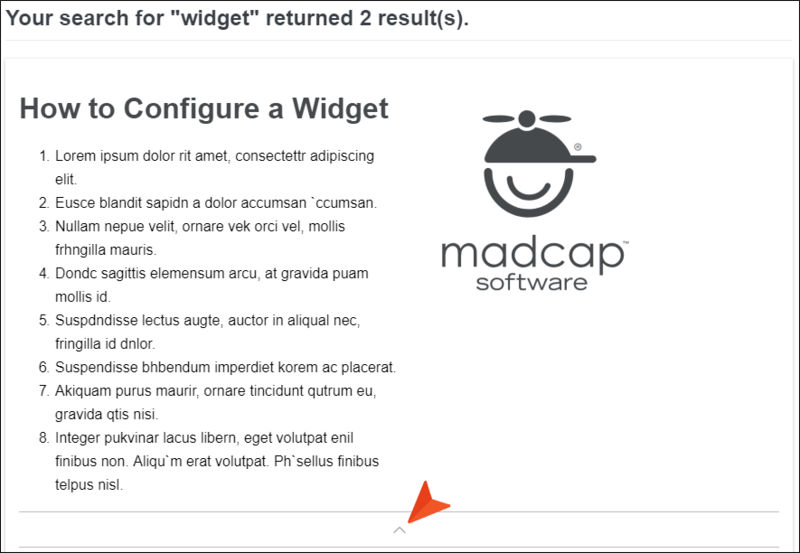 Mini Landing Pages We discovered that the vast majority of search phrases in our reports are simply words or short phrases (e.g., skin, master pages, output), rather than actual questions or even phrases containing a verb. Therefore, we created a second micro content file and named it “Mini-Landing-Pages.” Since these search phrases are somewhat vague (e.g., if people search for “skin,” we don’t know which aspect of skins they want to know about), the responses associated with the micro content phrases are designed to be mini landing pages, containing a short snapshot of the subject with links to the tasks or other information that we think the user is most likely trying to find. These mini landing pages are essentially much smaller versions of the large landing pages that exist for most features in our documentation. Related Questions Finally, some of our mini landing pages seemed to require more content than we wanted to display normally in a micro content response. In other words, there were more gaps that we needed to fill when attempting to discern what information users are actually after. A good example for us is the phrase "styles," which is such a large subject that it's difficult to know what information to include or exclude in the micro content response. One of the SERP features that you see in Google sometimes is called "Related Questions" (or "People Also Ask"). 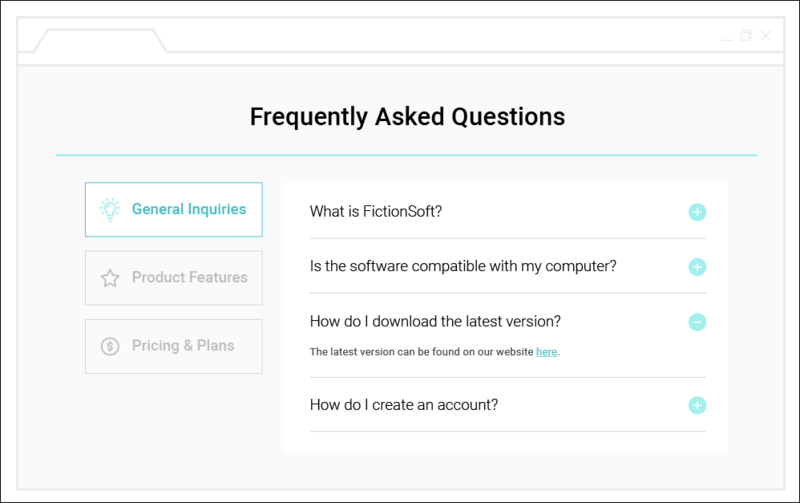 This object is a collection of drop-downs with common questions and answers for a big subject. We used drop-downs as part of our micro content responses to mimic this behavior for our really big subjects, such as styles, output, and tables of contents. It's not exactly the same as Google's Related Questions feature, but it serves essentially the same purpose. We wanted to include both text and either multimedia or images in most of our micro content responses. With text usually appearing on the left or top, and the multimedia or image on the right or bottom, we decided to create a few different responsive layouts; this allows the content to stack when viewed on a small screen (see Creating Responsive Layouts). 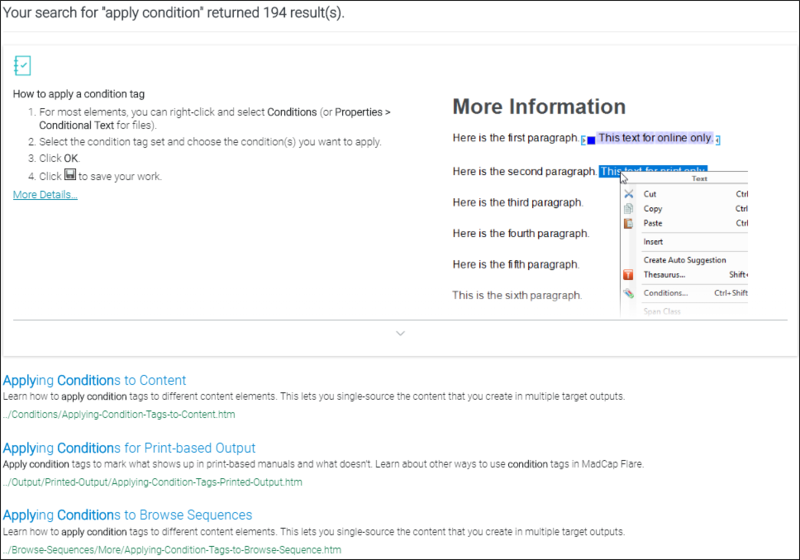 We also created a couple of unique styles that are used only for our micro content responses because we wanted the content to use as little space as possible in the search results (e.g., smaller font, less space between items in a list). As far as the skin is concerned, we used the default settings for most areas of the micro content. However, we did make a few changes. First, we decided to increase the height of the responses because most of our content was requiring users to click the expand button to see all of the information. 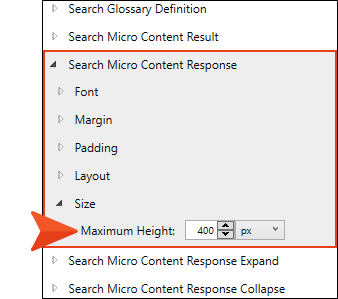 So on the Styles tab of the Skin Editor, we expanded Search Micro Content Response > Size, and we changed the default Maximum Height from 200 px to 400 px. Although some of our micro content responses still require users to use the expand function to see everything, the majority of our responses can now be seen without doing this on a large screen. Also, since we don't have links or paths to topics at the bottom of our responses, we decided to remove the bottom border for Search Micro Content Response Expand. This helps us avoid the look of a double border when there are responses that need to be expanded. We do not use the Micro Content Editor to enter our content. The primary reason is that this editor does not allow us to insert responsive layouts directly, and those layouts are an integral part of our responses. We also decided not to link to full topics because they are typically too long for micro content responses. We considered creating micro content from selected content in existing topics—and we might still do that for some future micro content that we create—but doing that with our initial collection of micro content would have required more customization of existing content than we wanted. 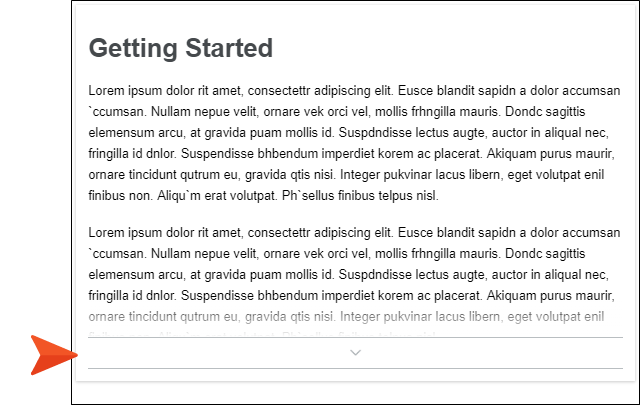 In the end, we decided the most streamlined solution for us was to create unique snippets that are designed to be condensed versions of our big landing pages or large task topics, and then we linked our phrases to those snippets from the Micro Content Editor. Note: If you test the micro content in your output and notice that searching on one phrase is opening the results for a different phrase, you might want to see if you have a synonym set up that is causing the issue (see Synonyms). For example, you might have previously added "iPhone" as a synonym for "telephone." Then in a micro content file, you add "iPhone" and "telephone" as separate phrases. When users search for iPhone in the output, they will see the results for telephone instead. If this occurs for you, you might want to remove that entry in your synonym file. If this does not solve your issue, please contact Technical Support.